I’ve only just recently joined the cream eyeshadow bandwagon, I always assumed they would crease on my oily eyelids. But as I have now found out they are actually very long lasting and don’t crease on me at all. So now that I know that I have a whole new range of products to discover, how exciting! I’ve collected these few over the past six months and I thought I would share with you what I think of them. 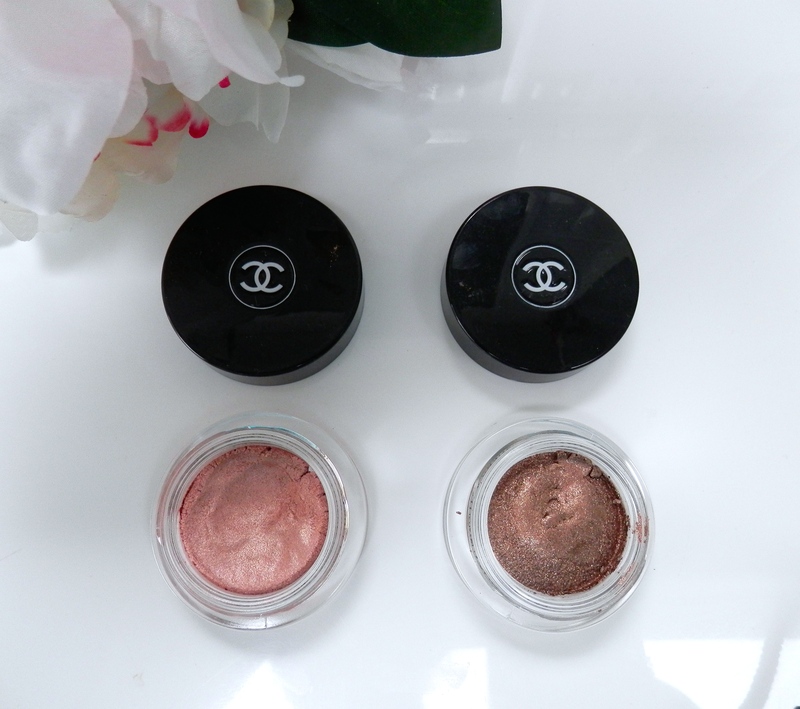 I’ll start with the high end ones, these two are the Chanel Illusion D’Ombre shadows. The first on is in the shade 82 Emerveille, it is a beautiful pink champagne colour that has a lovely shimmer throughout it. I’ve been using this a lot with the darker pink and brown shades in the Urban Decay Naked 3 palette for a soft smokey eye. The second shade is 827 Initiation, this a a very shimmery gold brown shadow. I normally use this with a dark matte brown underneath it, it doesn’t have much of a colour payoff so it needs a good base to work off. The thing I love most about these shadows is the texture, they are creamy yet powdery at the same time. They definitely blend like a powder shadow which makes them incredibly easy to work with. The next two are Mac Paint Pots, these are a very new discovery for me. I usually just go for the powder eyeshades from mac but after seeing the paint pots in use in a Pixiwoo tutorial I thought I would give them a ago. The first shade is Groundwork, this is a light brown shade that looks lovely washed all over the eyelid it is also great at evening out the eyelid. I often use this shade when I do a winged liner as its subtle yet there is still a hint of colour. The second shade is Quite Natural, this is a much darker brown shade which I use a lot all over my eyelid to give my eyes depth and then wear a dark lip like Nars Velvet Matte Lip Pencil in Damned, in winter this is especially striking. 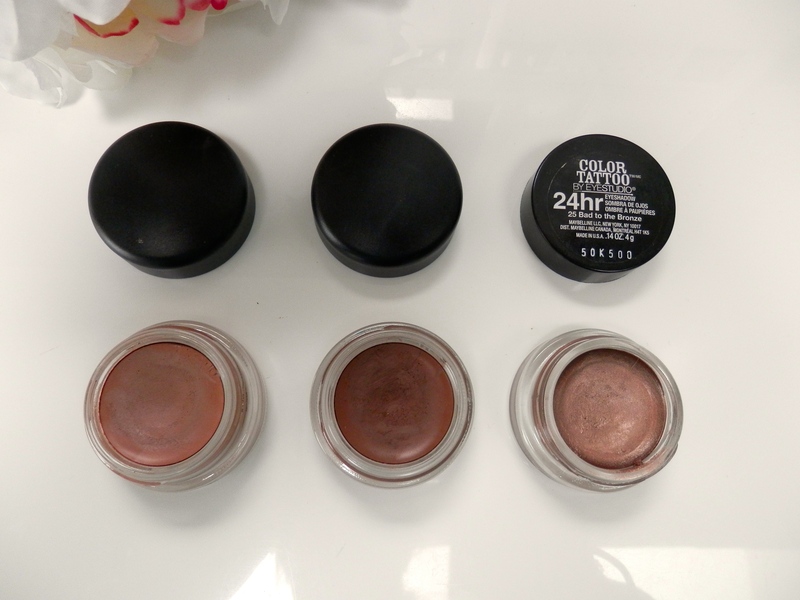 The formula of these shadows are very dry so you have to work quickly to blend them out. Quite Natural is extremely dry so can be quite difficult to blend but it is worth it once you get the hang of it. Lastly is the much loved Maybelline 24hr Colour Tattoo in Bad to the Bronze, this product deserves the love that it gets! I love the bronzy shimmer it has and how easily it blends onto the lid. Plus the lasting power of this is amazing, I always use this when I have a day to night function because I can trust it to stay put! 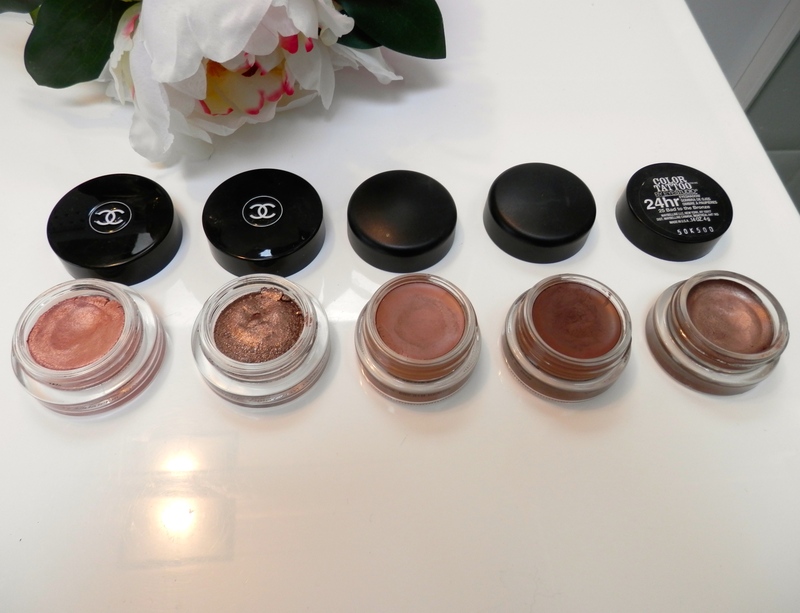 So I think its safe to say I have another addiction – cream shadows! Now I need to decide which ones to buy next.